Reserves are course-related materials that UH Manoa faculty have placed in the library for their students to use: books, textbooks, videos, DVDs, CDs, copies of journal articles, notes or copies of exams, faculty's personal copies, and electronic and streaming reserves. The items can be checked out for a limited amount of time so that all students are given the chance to access the materials. All items are taken off reserve at the end of the semester. Where are Course Reserves Kept? 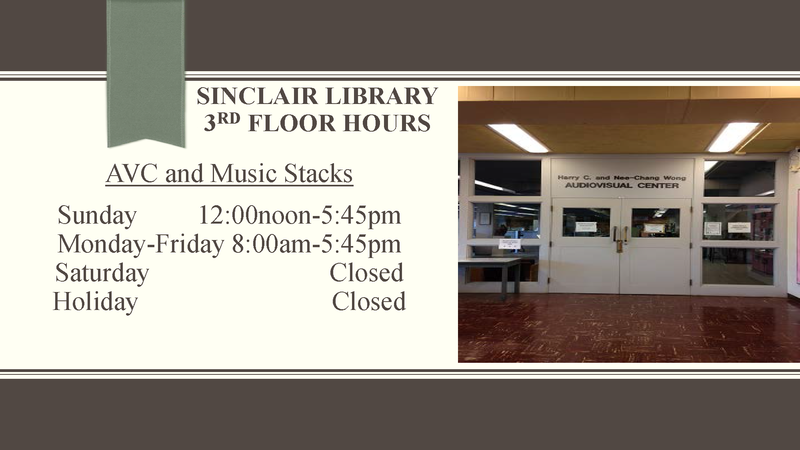 All physical copies of course reserves at UH Manoa are held on the third floor of Sinclair Library in the Wong Audiovisual Center and may be charged out during business hours. Electronic reserves are available for students to access through the Hawai'i Voyager Catalog 24/7. A valid UH username and password is required to view online reserves.